Is this a dirty word? I think there is some old council that says when yur in a boat sail first, pole second, paddle last! Anyone out there like to share some learning? Never found real info on where, ie how far from the bow to mount the sail and lee board. Sorry if I offend, not much beats a good paddle either! My own view is that in serious open-water situations... a near-bombproof upwind sailing rig offers more than almost anything else a open canoe paddler can carry: what's astonishing is not that they are used, but that so many try soldiering on without them! A significant minority of paddlers seem to be putting effort into FAILING to sail effectively, using overgrown flags rather than properly designed sailing rigs... and many more seem convinced that canoes can ONLY be sailed ineffectively: a shame, as others are going out showing that sailing well is no more difficult than sailing badly, and are showing that with a bit of thought, an ordinary open canoe with a basic rig and clip on leeboard can match or outperform dedicated sailing craft like toppers. The organisation to turn to for help and advice is the Open Canoe Saiing Group. The other starting point for advice and information is Solway Dory: great website, great folk behind the scenes, great kit - they are enthusiasts first and foremost and have stacks of experience to offer. Ps. Care needs to be taken in transposing North American canoe-sailing ideas into the UK (very different environments) but another great starting point is Todd Bradshaw's classic (and beautifully illustrated) Canoe Rig: the essence and the art. Last edited by GregandGinaS; 9th-November-2010 at 09:36 PM. Have a gander through this lot. What Greg says!^^! That trip he mentions is what I did some years back. There are some other sources of info such as what is in the BCU Handbook - a chapter on open canoe sailing with some ideas about rigging a boat up for effective sailing. 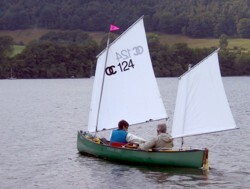 Do come along to one of the OCSG meets next year and see some boats that work well. Our programme of events has yet to be sorted but we try and spread them round the country as far as possible - there might even be one at Poole with a bit of luck. There are some other sources of info such as what is in the BCU Handbook - a chapter on open canoe sailing with some ideas about rigging a boat up for effective sailing. Another way to get guidance from Keith, Dave Stubbs, Steve and others is via the OCSG Facebook pages. What's the evidence for that, Greg? I'm an historian by training... but my area of study was in West Africa rather than in the South Pacific, and my interest in the history of canoe sailing has not extended much beyond what I've discovered online. Last night, for an easy life (in part thinking "I've no idea where my books are), I just went back to the potted history of canoe sailing on the Solway Dory website. That doesn't give sources, but assumed I'd find something more in Bradshaw's book: nope, he just says "eons"! I'll try and find time to look elsewhere later... but maybe Keith or one of the others can chip in. There's plenty of canoe sailing goes on, probably a wee search on sail or sailing will turn up enough reading for a month. The OCSG are the experts though (as you would expect) and like most things, it's a question of how far do you want to go. The OCSG have a good blob of information in one place here You can go from holding an umbrella or small tarp up at the front of a boat through pop up sails, kites, removable sailing rigs, fixed sailing rigs, rudders, keels, extra flotation, outriggers.... etc etc. If you fancy the sailing aspect then you can take it pretty far and get a pretty capable boat, the choice is yours. I prefer to paddle and then get a free ride if I can, I've a removable thwart (which has never came off in use) as I need to use my boat as a tandem occasionally. I know the Polynesians got around the Pacific canoe sailing. But I'm pretty sure that's only over the last 2,000 - 3,000 years, (the last major migration to New Zealand occurring 700-1,000 years ago)? Oh, and hi mike4595 . Look forward to seeing what you come up with. what do you think of this rig http://www.kayaksailor.com/ ? it might sound crazy but i'm searching for something that would work on my pakboat and this sounds like the best option so far. I've a removable thwart (which has never came off in use) as I need to use my boat as a tandem occasionally. Adding sails to a tandem seems to be done in a host of different ways. If fitted, a front thwart can be replaced with a sailing thwart, or an additional (sailing) thwart can be fitted behind the front seat. 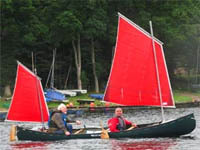 On a symmetrical canoe, a rear thwart can be replaced, allowing the canoe to be sailed backwards. Yet another option (and the most elegant to my mind) is two smaller sails: one right in the bows, and a smaller one behind the stern paddler's seat. i'm searching for something that would work on my pakboat and this sounds like the best option so far. Hull rigidity to cope with the stresses from the sail would presumably be the big issue. The kayaksails you mention would seem to be about the same size as the mizzen in the above photos (~14 square foot), so shouldn't be an issue... but that's a VERY small sail area. If Dave Stubbs (at Solway Dory) thinks your packboat could take a 30 square foot main as well, I'd have though that would be a lot more satisfactory! Sounds more familiar... but I'm damn sure I've come across something else on this somewhere: can't find it now though! In the mean time, I'll point anyone with an interest towards the following quite facinating 1935 account of modern canoe sailing (from an American perspective): Sailing Canoes: A Brief History by O.S. Tyson. "Canoe sailing dates back some 25,000 years"
Who needs evidence. It stands to reason. You would have to be a real Neanderthal not to realise the sailing potential of a canoe! Sailing is a superb complement to the other skills such as lining, poling, portaging and paddling necessary to take canoes on journeys. I can't add more to the information provided above except to urge you to have a go. You will learn so much about canoeing and sailing in the process. yes it's small. the bigger one is more like 17square foot but still, i was thinking the same thing. on the other hand, a larger one would mean more stress on the boat's frame. i don't think i saw that statement from dave stubbs on the solway dory site. do you know if anyone actually tried 30 sq ft on a pakboat, or any other sail? the tricky part with the folder is that the sailing rig will need to be attached to the frame in a way that doesn't require fixed installations, i.e. must retain the 'packability' of the boat. the kayaksailor seems to be pretty well suited for that. Check this klepper rig out. Hey the Neanderthals weren't so dumb. Don't put us down! There is some evidence that the Neanderthals survived until 24,000 years ago, so maybe it was them who invented the sailing canoe. At any rate, -25,000 years puts it in the Upper Palaeolithic period. So I was wondering - are there cave paintings of canoe sailing? Or have dugout canoes been excavated with mast attachments for mammoth skin sails? OK... I've just talked to both of the Daves in succession. 1. Sounds like something on the scale of the 30 square foot lugsail would be the way to go on the Pacboat IF you can get a rig to secure adequately. A singe 30 square foot sail might be easier and more effective than two 14 square foot sails in terms of mounting... but the twisting strains from a pair would obviously be less, and the difference in sailing performance shouldn't be too great. Maybe some detailed photos of what's available as attachment points and for bracing might help: folk here, in the OCSG and in the home built boat rally circles would undoubtedly then come up with an assortment of practical (and maybe less than practical) means of securing the rig! 2. Dave Poskitt is going to change the website ASAP as it shouldn't say 25,000 years: that's too precise, and too early! I'm not going to try and relate what he started discussing over the phone about the Sunda Shelf and so on.... but he's clearly taken a fair interest in the history, and points all concerned to books / articles by Adrian Horridge and to Stephen Oppenheimer's "Eden In The East" for context. ...and so the interesting bit of the afternoon ends: time to go and deal with tired 6 year old! Edit: and finally, something good that can be accessed directly: Origins and Relationships of PacificCanoes and Rigs. Last edited by GregandGinaS; 10th-November-2010 at 03:12 PM. thanks for your encouraging input so far! 'Sail your canoe' by John Bull (cordee I think). Tells you how to build a rig then how to sail it. I quite like the look of that kayak sailor--even if it is small. 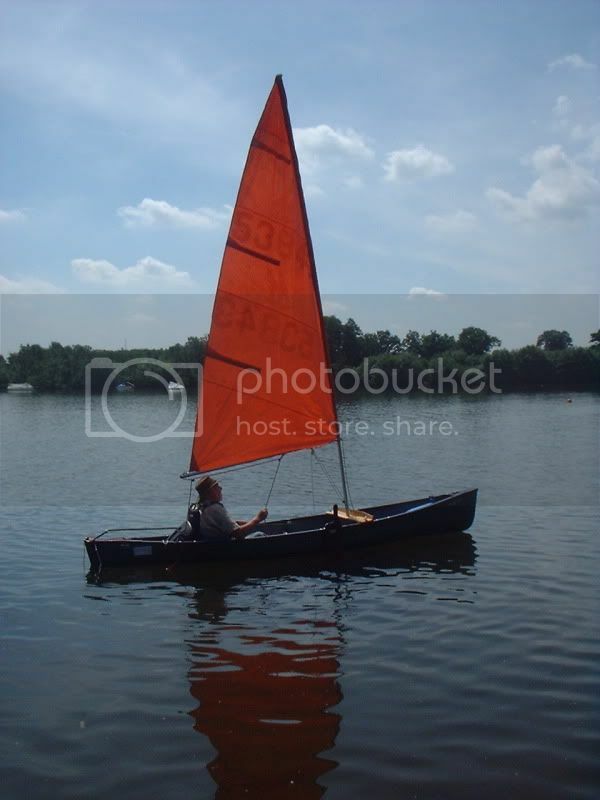 I've an ancient folding Klepper and an Apache glass fibre canoe and would love to have a small folding sailrig that could be used with either. It looks compact for transport, and easy to raise and lower, which I remember was a comment Magikelly made about his popup downwind sail that he reviewed recently, which struck a chord with me. Easier to bring and use means more likely to be used. I wonder if it has been reviewed anywhere? Is there any reason it wouldn't work as well with a canoe as a kayak? 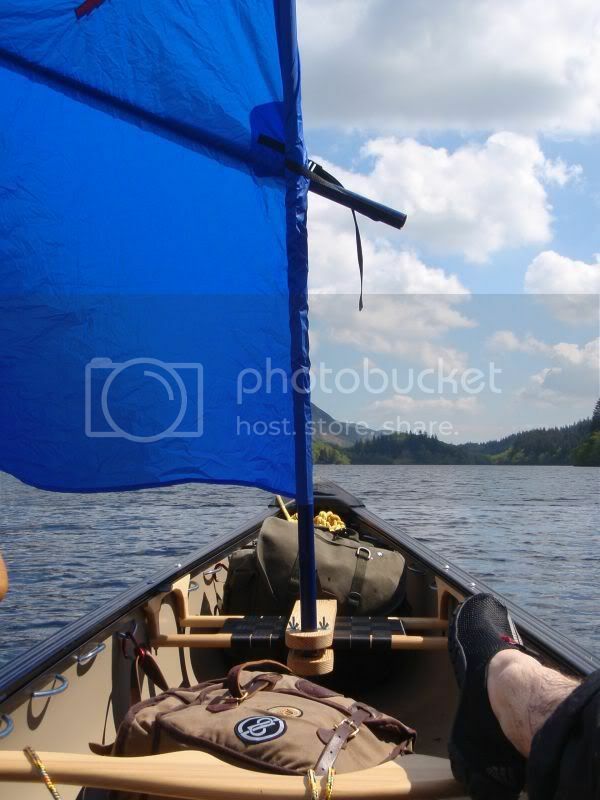 Would have to think hard about attachment points, both on the folder and the canoe, as they seem to assume mounting would be on a plastic boat; but it looks like it works when tied on, so might be doable. Thanks for mentioning it. Would be nice to hear the views of someone who has one, and has also sailed other things too. Is there any reason it wouldn't work as well with a canoe as a kayak? Would have to think hard about attachment points, both on the folder and the canoe, as they seem to assume mounting would be on a plastic boat; but it looks like it works when tied on, so might be doable. Answering my own question, I suppose the lee boards might not be deep enough in the water if the canoe has much higher freeboard than a kayak. Any thoughts? I wonder if it has been reviewed anywhere? Is there any reason it wouldn't work as well with a canoe as a kayak? i'm not sure about reviews, there's something they quote on their website but i haven't found anything further. i think they're pretty new and just not very well known yet. it should work with a canoe as well. 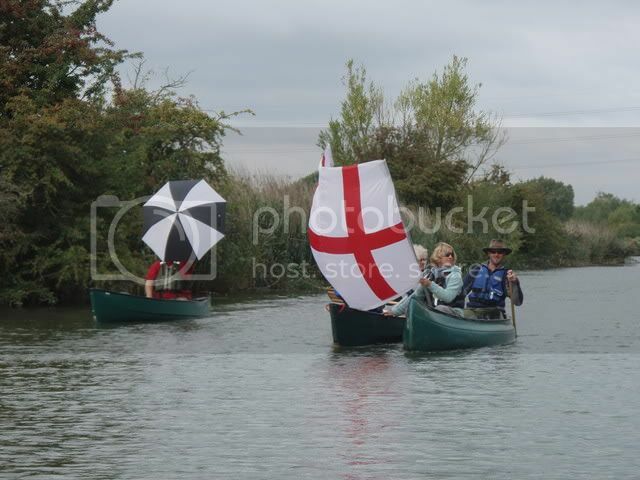 look through the pictures on their site, they show some canoes and even a folder. you are right, it seems well thought out in terms of handling and looks like a decent profile. costs quite a bit of money, though. Mount points on a folder. This might help answer your question about mount points on a folder, lowlander. The fastest of all single handed sail boats is a canoe! Last edited by wavecloud; 11th-November-2010 at 04:35 PM. Not any more I'm afraid. Foiling Moths can out drag a canoe, but fall over even more often. To every opinion there is always an equal and opposite opinion. Whats a Foiling Moth? Is it like a british moth? Foiling Moth - is it a boat - plane or ???? 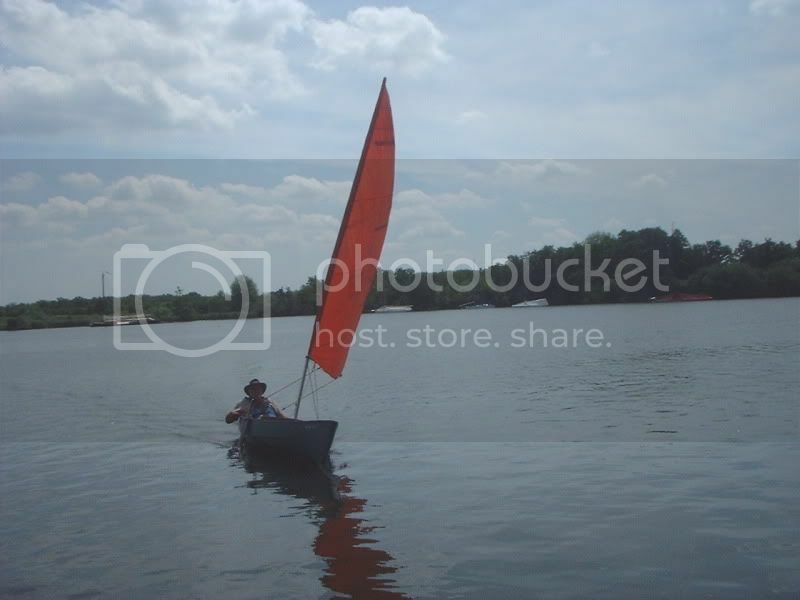 canoe sailing or sailing canoe? foiling moths look like a lot of fun. but where does the kelly kettle tent and fire box go? and what is the river performance say on Grade 2? There has to be a line where a canoe becomes too specialised and loses its broad range of applications. so there are 2 schools of thought here. i am in the first group, my canoe needs to be versatile and used on rivers, canals and open water. It needs to carry equipment for camping and ideally be able to carry 2 people. it also gets used for shelter. the OCSG does seem to have embraced both schools of thought and their criteria are demanding. Can you sail across the wind, leaving and returning to the same place? Can you sail a Triangular course? After this we look at efficiency, how close to the wind can you sail? oh and for all levels can you stop make camp and cook dinner. then pole upstream later. Just not sure if it is as big as you want. thank you! i read your review with interest. i'm not sure this would do what i want, however. it looks good for a downwind lift but it's hard to imagine it working well upwind. any experience how it performs at different angles? i don't want to convert the pakcanoe into a clipper. in teespaddler's categories i would be in group 1. what i'm most interested in is getting some relief in a headwind, and, generally, having a bit of fun sailing the canoe in different conditions, seeing what it can do. if i had to chose i'd go for a smaller, more efficient sail instead of a huge one that only works downwind or at very moderate angles. i notice the op has gone very quiet - hope we haven't scared him off? Thanks for that, Jurassic. It looks quite nifty, though doesn't seem to be quite the same thing as the Kuvia KayakSailor. What I like about the look of the KayakSailor sail is the ease with which it pops up and down at the pull of a cord. It's small, as Greg and Lowlander point out; but that mightn't be a bad thing for a relative novice like myself. We have used the rig on several canoes. The leeboards can span a 36" beam. In our experience the Kayaksailor works best on solo canoes, mostly because of their lower freeboard. The leeboards are 27" long and you need about 10" of blade underwater in order to make decent progress to windward. If you send a photo or the year name/model of your canoe, I will be happy to look it up and give you some feedback. We have sent several rigs across the pond to the UK. Please provide a receiving address and I will happily research the different shipping options available. As my Apache is 17" high at the bow and about a foot at the centre of the boat, it seems to me I would have more than the 10" of blade underwater. And I could also use the rig on my Klepper as well. It looks as though I might have to be inventive about attachment points though. Here's a little bit of canoe sailing fun. Yet both canoes are regularly used to paddle rivers too. Just to show how versatile they can be. Intend to make a 'WINDPADDLE' type sail, got the hoop part from the 99p shop & got an old lightweight tent I can use for the material. Got the pattern for the sail from a website 'HOW TO MAKE A SPHERE' just need to get around to making it . That sounds like an interesting project you have there. I'll bet I'm not the only person interested to hear how you get on. Any chance of photos and/or a 'how to' write up? I will put pics on if I ever get around to making it the website for how to make a pattern & sew a sphere is HOW TO SEW A SPHERE As a back up plan might buy another large umbrella from Poundworld . I actually made the template a couple of months ago & even had a few goes with the sewing machine & some old sheets. Should have time but being retired is hard work, after 5 years still trying to get all those jobs done we put off while working. As well as that we are trying to get the motorhome packed ready for heading south in Feb for 3 months. On a serious note, canoe sailing? go for it! I did eventually get around to making my own version of the Windpaddle, it was really awkward to get it to fit well around the wire frame I had. Making the sphere part was simple enough using the pattern form the website I listed. Also made a sail we could slip over the paddles. Result of extensive testing (well a couple of goes ) both ideas were rubbish . 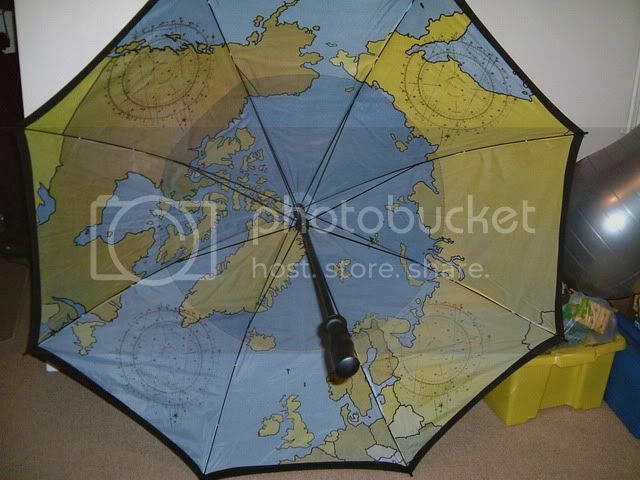 Best solution up to now has been 2 umbrellas bought from Poundworld. We are in Spain at the moment at La Manga, nice to be out on the Mar Menor in the warm weather. Had some fun sailing with 2 umbrellas, today found that we reached the limit they could take before blowing inside out, we got up to a reasonable speed & found we could control it a fair bit but obviously only downwind. Determined to have another attempt at making some sort of proper sailing rig when we get back. Only here for another week then starting a slow drive back via the south of France so hoping to find some nice rivers to paddle along.